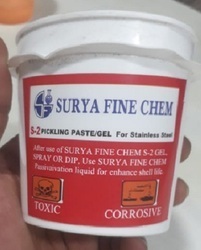 Manufacturer of a wide range of products which include pickling paste. We have in store a wide range of Pickling Paste. The products are used for the formulation of a high adhesion stainless steel pickling gel for various pickling applications. Made using Australian technology, during welding of stainless steel the offered products are used to remove the black oxide marks or burn scale left. Looking for Pickling Paste ?